It seems pretty obvious at this point that the number one reason for Katie Holmes leaving Tom Cruise, is her daughter’s well being. Suri is six now, no longer a baby but instead school aged. In other words, she is ready to sit down for a few hours a day in order to be educated. Unfortunately, it looks like Tom was more concerned with teaching his little girl in Scientology, likely even introducing her to Sea Org, than he was inclined to just let her be a normal child. 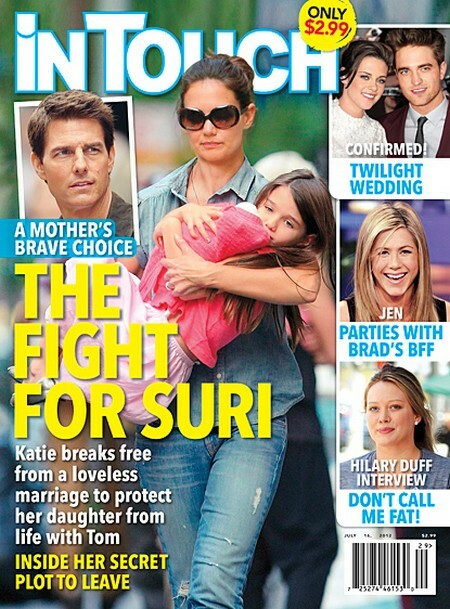 The new issue of In Touch has details on how Katie ran from her loveless marriage in order to protect Suri from the radical religion. Here’s a bit of what the magazine has to share. I have to admit, I always wondering how this situation was going to work out once Suri was a bit older. I never really believed that Katie was that gung ho about Scientology but rather, she went through the motions in order to please Tom. Now that really does seem to be the case. I suspect the battle for Suri is going to get ugly pretty quickly. Filing for sole custody, as Katie has done, is a pretty bold move to make right out of the gate. It’ll be interesting to see Toms’ response when it comes to his own filing. Do you believe that Scientology is what split this duo? Tell us your thoughts in the comments below.